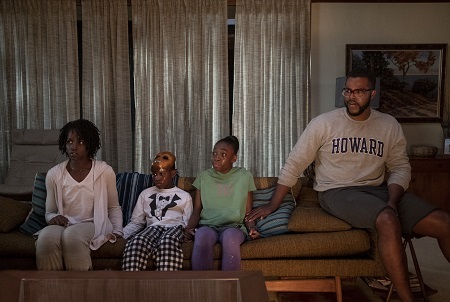 Adelaide Wilson (Lupita Nyong’o) and her husband Wade (Winston Duke) have descended upon their vacation home in Santa Cruz with children Zora (Shahadi Wright Joseph) and Jason (Evan Alex) for a summer holiday. They meet up with their good friends Kitty (Elisabeth Moss) and Josh Tyler (Tim Heidecker), along with the twin daughters Becca (Cali Sheldon) and Lindsey (Noelle Sheldon), on the beach beside the waterfront boardwalk. It is a spot in California Adelaide knows all too well. In 1986 she went missing for a brief time after wandering off from her parents on the boardwalk after having gone into a mysterious hall of mirrors for reasons she could never fully explain, the experience giving her a minor case of post-traumatic-stress she’s been living with ever since. That evening Wade finally is able to get his wife to come clean about her past. But as Adelaide does so and begins to reveal what transpired in that hall of mirrors, Jason comes into the living room with a terrified look on his face. There is a family in the driveway. Four people. All in red jumpsuits. A man. A woman. Two children. All just standing there. Not moving. Not doing anything. Staring at the house. As Adelaide calls the police Wade attempts to shoo them away. But this quartet has no intention of going anywhere. In fact, they want inside the Wilson family’s house. More to the point, they want to make it their own. Us is writer/director Jordan Peele’s follow-up to his Academy Award-winning debut Get Out. It is a nightmarish excursion into a very different kind of domestic darkness, this eviscerating look at American life spun on its head a suspense-filled operatic aria of shadow and fog where humanity is in short supply and empathy could potentially get you killed. And yet, it is also a richly emotional saga of familial resilience, a tale of selfless sacrifice where parents lay it all on the line for their children while the kids find an inner strength partially born from their mother and father’s teachings they likely didn’t even know was there until it was needed most. This combination gives the film a character-driven center that’s authoritatively tenacious, allowing the finished feature to achieve a level of suspense that’s distinctively discomforting. The focal point is Nyong’o. 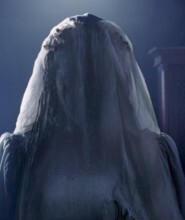 The 12 Years a Slave Oscar-winner is mesmerizing, starring in the film as both as the determinedly resolute Adelaide as well as her raspy-faced doppelgänger known only as “Red,” a mysterious woman who appears to be in command of her fellow three home invaders looking to do the Wilson family harm. The actress is stunning, achieving a level of introspective eloquence that’s haunting. The facets of her two dual humanistic recitals of motherhood on the brink of disaster intermingle together, each character a distinct part of a greater whole, almost as if Adelaide and Red are yin and yang splintered in half trying to find a way to reconnect before it becomes impossible for them to do so. Nyong’o holds the screen with graceful ferocity, the hidden truths lying seductively at the heart of Peel’s twisted morality play only revealed thanks to the mesmeric intricacy of the actress’ performance. 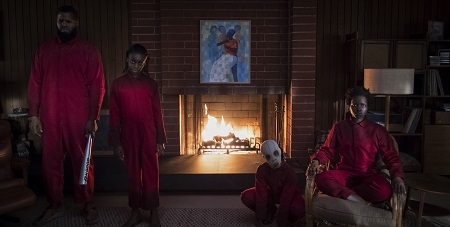 The remainder of the primary cast is equally strong, especially considering that they, too, are portraying two very different facets of a parallel entity, each character having their own individualized homicidal duplicate looking to become the dominant party in a liaison only one half of the relationship apparently knew anything about. Duke, who made such a titanic impression as the resolute M’Baku in Black Panther, is surprisingly laidback and adorably comical, the actor’s ability to not take himself too seriously allowing Wade to attain an endearing affability that makes his transformation into a bullish protector of his wife and children all the more affecting because of this. As for relative newcomers Joseph and Alex, they’re great, each having a number of strong individual moments where they’re allowed to make their respective characters come to life in increasingly captivating ways. 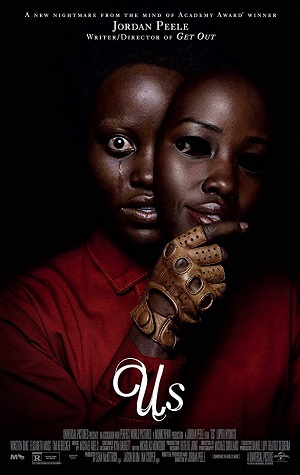 But this is a director’s showcase, and while I will not say all of Peele’s narrative tricks work as well as I’m certain he intends them to, there is a constant state of angst-riddled dread that permeates this film down to its marrow. Superbly shot by Mike Gioulakis (Glass, It Follows) and masterfully edited by Nicholas Monsour (Keanu), the picture has a visual allure that’s increasingly innervating, and thanks in large part to composer Michael Abels’ (Get Out) violently gripping score even the moments of lighthearted levity kept me glued to the edge of my seat wondering what was going to happen next. Peele orchestrates events with marvelous confidence, his ability to fill every corner of the frame with a sense of foreboding uncertainty not to be taken lightly or casually dismissed. I had some of the more dexterous twists clocked relatively early on, and as such a climactic reveal didn’t shock me near as much as it appeared to unsettle the majority of the promo screening audience I had the pleasure to watch the film with. I also feel like Peele doesn’t flesh out all of the ins and outs of his scenario in ways that are easily digestible, some of the larger chunks of the narrative not so much undercooked as they are under-seasoned meaning they leave a slightly odd aftertaste after they’ve been swallowed. Even so, Us is a rapturously astonishing excursion into the unknown that’s so consistently unnerving there were numerous moments where I felt as if I was watching it through the clenched fists that were covering my eyes. Couple all of that with Nyong’o’s dazzling central performance and Peele’s latest is an apocryphally macabre spellbinder of an America at war with its own mirror image I couldn’t help but adore.